After the area around the Tidal Basin was established as West Potomac Park “for the recreation and pleasure of the people,” the park became very popular. People enjoyed the park by foot, car, or horseback. The first cherry trees were planted in the park in 1912 and congress introduced a resolution to authorize the erection of a memorial to Thomas Jefferson 14 years later. The location of the Thomas Jefferson Memorial was changed a few times before construction started on November 17th, 1938. Both an island in the middle of the Tidal Basin and the intersection of Constitution and Pennsylvania Avenue were proposed as potential sites for the memorial. Despite the time spent on determining a location for the memorial (three years!) there was still some controversy surrounding the final location. On the day the construction started, fifty women marched on the White House. They petitioned to stop the damage that was falling upon the cherry trees at the memorial site, which were supposed to be uprooted due to the construction. These women led the “Cherry Tree Rebellion,” which consisted of them chaining themselves to a tree at the construction site. Roosevelt, who had been personally involved with the construction of the memorial (he personally contacted the Commission of Fine Arts about creating a memorial for Jefferson), was frustrated with the group of women and felt they were over exaggerating. There were thousands of trees at the Tidal Basin, and just 88 were supposed to be removed. The women eventually were convinced to give up, and Roosevelt had the trees removed in the middle of the night to avoid any further conflict. The memorial was officially dedicated by Roosevelt on April 13, 1943, the 200th anniversary of Jefferson’s birthday. The Tidal Basin was once the site of one of Washington’s most popular beaches, featuring a diving platform and a cabana. In the 1880s, it was constructed out of the mudflats of the Potomac. Shortly after its construction, the Tidal Basin was filled with swimmers and bathers. In 1914, Congress voted to create an official beach on the Tidal Basin for white patrons. The Tidal Basin, surrounded by the Jefferson Memorial, Martin Luther King, Jr. Memorial, and the FDR Memorial, is part of West Potomac Park in Washington, D.C.. The basin itself is about 107 acres in size and 10 feet deep. It was not designed as a swimming area, but instead to function exactly as its name implies. It controls the flow of water from the tidal section of the adjacent Potomac River. In the 1920s, the all-white beach was a popular spot in the hot summer months. Women and men hung out there, but there is record of police measuring women’s bathing suits to make sure they were not more than six inches above the knee. Black residents swam at a spot across the basin where there were no official buildings or diving structures. In the face of pressures from African American leaders to build a black bathing beach on the other side of the Tidal Basin, The Senate voted to close the white bathing beach in 1925. The area where African Americans swam never received any funding or buildings. Funds for a beach for African Americans were allocated and then repealed. The buildings were demolished and the sandy area was landscaped with a variety of plantings to hide its previous life as a beach. Today, swimming is not permitted in the Tidal Basin, but people of all races and from around the world are free to enjoy it as well as the monuments surrounding it. Major Ellsworth was not an unknown quantity in the Northern states. Previous to the war, Ellsworth and his Fire Zouaves barnstormed in many of the cities of the north, exhibiting their acrobatic martial drill. Many Northerners would have seen his face before, either in person at a performance, or in the newspaper or playbill. He was in affect the Kanye West of his day. Both sides now have their respective martyr moment and are using powerful language in the press to describe why the struggle is so important. Assassination, murder, killed by federal soldiers, defense of his home and sacred state. These are the types of words that are meant to ignite young men’s passions and encourage them to rally to the Flag. Now both sides will muster tens and hundreds of thousands of men into their armies and home front support infrastructure. Alexandria will become a home front support town from that day, ironically for the North who will occupy the city for the duration of the war. Next, Mercy Street, the real story. On the early morning of 24 May 1861, the Union Army prepared in Washington for a two pronged assault on the seaport town of Alexandria. Most of the army crossed the Long Bridge to the Virginia side of the Potomac and proceeded south about 8 miles into the north end of the town. Simultaneously, a significant Union amphibious force landed on Alexandria’s waterfront. Amongst the amphibious forces was a unit from New York, the Eleventh Volunteer Infantry Regiment also known as the First Fire Zouaves. 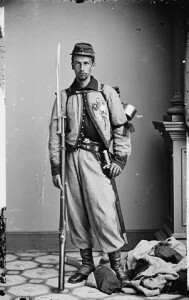 The Zouaves were led by a dashing young Union Major Elmer E. Ellsworth. Ellsworth was already known in military circles nationwide. His Zouaves barnstormed throughout Northern towns before the war displaying their talents in martial and sartorial showmanship. They were the Marine Corps Silent Drill Team of its day. The Zouaves and their leader were well known quantities in the North and possessed a celebrity status. Ellsworth was also a bosom friend of the Lincoln family having clerked for Lincoln in Springfield before the war. Upon arriving at the Marshall House, Ellsworth proceeded into the establishment with a small detail of men to take possession of the flag. After taking the flag down and while proceeding down the staircase to the second floor, Ellsworth was shot and killed instantly by Jackson. In turn, Corporal Francis Brownell returned fire and bayoneted Jackson killing him instantly. Hence, the first two casualties of the Civil War by guns fired in anger. On the same morning of the events at the Marshall House, just three blocks away, many of Alexandria’s men are mustering at a pre-determined place in order to gather themselves to march south to join the armies of the Confederacy. To be discussed in the next blog are how both sides used the power of language to describe these happenings in Alexandria in order to inflame their respective populaces and garner support for the coming war. This coming January, PBS will air the new mini-series Mercy Street staring Josh Radnor and Mary Elizabeth Winstead as a Doctor and Nurse working together in Union occupied Alexandria, VA during the Civil War. Ms. Winstead plays the part of New England abolitionist Mary Phinney. Her rival, played by Hannah James, is an entitled Alexandria woman named Emma Green who nurses soldiers alongside Phinney. Mercy Street will be an exciting piece of historical fiction noting the tensions of persons on opposite sides of the war working in close quarters. The real history of the men and women of Alexandria at the time is worth telling. In this an upcoming blogs, I propose to tell the story behind these historical characters in preparation for the series start in January. Before discussion on the persons surrounding the story can begin, it’s helpful to set the scene on what is going on in Alexandria 1860 and 1861. Throughout the South in 1860, there is talk of secession if and when the “abolitionist” Abraham Lincoln is elected as President. At this time in Alexandria, there is a strong sense of belonging to the Union given the significant merchant ties that the citizens have with all sections of the nation. In early 1861, the sentiment in Alexandria is going to change to a vast majority supporting secession and the new Confederate government. Two incidents are the catalyst: The firing on Fort Sumter on 12 and 13 April 1861 and the Virginia Ordinance for Secession passed on 17 April 1861. Almost overnight Alexandria turns from a loyal Southern city to a Confederate hotbed. The Virginia Ordinance for Secession was ratified by voter referendum on 23 May. The next day is arguably the most momentous in Alexandria’s history. In response to the referendum Union troops have prepared across the river in Washington City to invade Alexandria. To be discussed in the next blog are two significant events that happen in Alexandria on 24 May that will greatly influence America’s history and set the stage for Alexandria’s most intriguing era.